Maryland’s tailwater fisheries such as the Gunpowder, Savage, and North Branch of the Potomac are all at great flows with water temps in the mid 50’s. 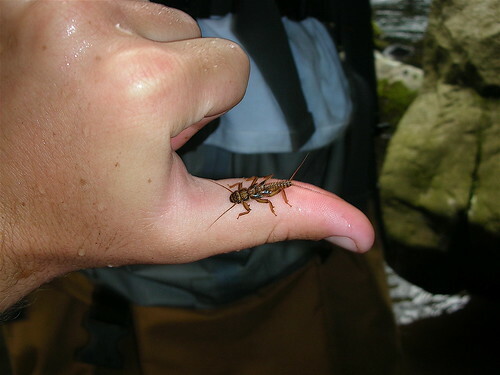 Summer hatches of tricos, caddis, bwos, stoneflies and midges are hatching on these rivers through mid to late Summer. The hatches can often be overlooked, in favor of fishing terrestrials, which is some of the most fun and productive fishing. Japanese beetles, crickets, moths, ants and grass hoppers are already crawling on the foliage on the river banks. Guiding and fishing on the Gunpowder the past month has been fun as the trout are really looking up now, and willing to eat a variety of flies. The presentation and approach is critical since the trout are a little wary under the bright midday sun, hiding in logjams, under bushes, branches and undercut banks. Draw the trout from their cover using a bigger dry fly or putting the fly inches from the bank or structure. A beetle or ant has been extremely productive for many anglers fishing throughout the catch and release water. A long leader, 6x-7x tippet and a bit of stealth will help catch these wary, but hungry trout. Backwater Angler Intern Alex McCrickard caught these two nice Gunpowder browns while floating with me through some quiet water. One brown exploded on the hopper when he cast it into the shadows as we drifted along, and the other larger fish took a huge black Kaufmann’s stone he bounced on the bottom. I took two trips to western Maryland in late June and again in early July for fishing on the Savage and North Branch of the Potomac Rivers. The Savage River browns were hungry for size 12-16 dries fished in the pockets, behind rocks and along ledges. I caught some 14-16 inch browns and rose a few 17-18 inchers after two afternoons of fishing the Savage. The action wasn’t dependent on any specific hatch matching situation, but more about covering water with big dries, especially the rough water areas. While walking the trails along the North Branch in the mornings, I noticed that hoppers were flying about in good numbers. Some 20 inch browns were willing to inspect my foam and deer hair creations, but dropper nymphs accounted for many smaller fish and a good 19 inch rainbow. Ice cold flows, optimal levels and wild trout on terrestrials, means Maryland is the place to fly fish during these hot Summer months. This entry was posted in fishing report on July 29, 2008 by Jason du Pont. Please join us for a flyfishing school. On Sunday, August 17, a Backwater Angler Guide will be teaching a fly fishing school that is ideal for beginners. If you’re planning on flyfishing Maryland, or anywhere else for that matter, this course is a great introduction to the sport. The school covers knots, casting, gear and fly selection. Schools are held in a meadow overlooking the Gunpowder river by a Maryland state licensed and insured fishing guide. Class is held from 11:00 AM till 2:00 PM. Cost is $100 per person and includes the use of gear. Class size is limited to 4 and pre-registration is required. Please give us a call at 410-329-6821 or drop us a line at info@backwaterangler.com to pre-register. This entry was posted in events on July 29, 2008 by Theaux Le Gardeur. Please join us for a flyfishing school. On Sunday, August 10, a Backwater Angler Guide will be teaching a fly fishing school that is ideal for beginners. If you’re planning on flyfishing Maryland, or anywhere else for that matter, this course is a great introduction to the sport. The school covers knots, casting, gear and fly selection. Schools are held in a meadow overlooking the Gunpowder river by a Maryland state licensed and insured fishing guide. Class is held from 11:00 AM till 2:00 PM. Cost is $100 per person and includes the use of gear. Class size is limited to 4 and pre-registration is required. Please give us a call at 410-329-6821 or drop us a line at info@backwaterangler.com to pre-register. Please join us for a flyfishing school. On Sunday, August 24, a Backwater Angler Guide will be teaching a fly fishing school that is ideal for beginners. If you’re planning on flyfishing Maryland, or anywhere else for that matter, this course is a great introduction to the sport. The school covers knots, casting, gear and fly selection. Schools are held in a meadow overlooking the Gunpowder river by a Maryland state licensed and insured fishing guide. Class is held from 11:00 AM till 2:00 PM. Cost is $100 per person and includes the use of gear. Class size is limited to 4 and pre-registration is required. Please give us a call at 410-329-6821 or drop us a line at info@backwaterangler.com to pre-register. Cloudveil’s Inertia Plus Fabric with Primeflex used on its Inertia Peak Pants and Spinner Shirts is one of the most innovative technologies offered by the major angling clothing brands. The yarns resist deformation and have NO propensity to hold water, treated with Kudos FP, 100 wash super durable water repellent. At first glance the shirts and pants appear no different than the typical multi-pocketed fishing clothing, but this fabric’s ability to repel water is closer to rain gear. 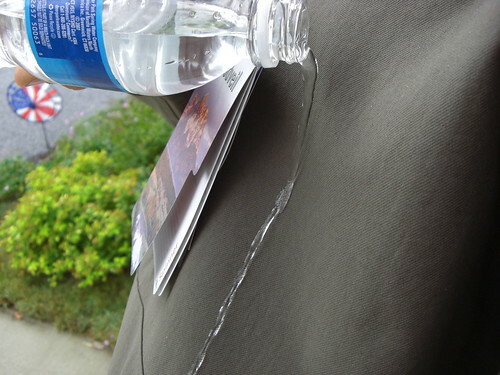 Water beads on contact with the fabric and sheets off like raindrops on a windshield treated with Rain-X. The shirt and pants allow an angler to remain cool on mild to warmer days, yet handle a brief unexpected Summer shower, which are quite common this year. Another reason for anglers on tailwaters to take note is that the icy summer flows and changing air temps create times when a long sleeve is welcome after hours in thigh deep 56 degree water, especially in the evening and mornings. 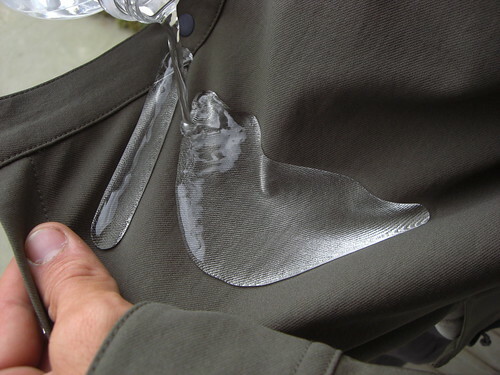 The pockets on the shirt and pants add numerous places for tippet, floatant, and fly boxes for anglers wet wading or hiking into brookie tributaries. The Spinner Shirts are available in Tarmac and Spray Green; the Inertia Peak Pant in Tarmac and Covert Green, which are colors that won’t spook trout, and look good enough to wear around town. This entry was posted in gear, reviews on July 29, 2008 by Jason du Pont. The Gunpowder is flowing at 75 CFS, is clear and 54 F. Fly fishing in the Catch and Release section has been very productive. The fish are frisky and are looking up. Great reports of Caddis in the morning in the #18-20 range above Falls Rd. have been working fine. Terrestrials in the afternoon have been easy enough to imitate with Grand Hoppers and Japanese beetles. These patterns are creating quite a stir in the foam lines along the banks. Bi-Visibles in the #14-16 range have also been working in the fast riffles and a few Olives have been reported each afternoon as the clouds roll in. A Hornberg fished dry as a hopper accounted for a nice 15″ fish at Masemore Saturday morning. The Hornberg will also work great as a streamer-think tiny rainbow=food, at the end of a drift. Fish have been midging midday above Falls Rd and a Zebra midge just might be the ticket. If you’re not quite ready for midge mania, check out the new terrestrial patterns in the shop including Jason du Pont’s Gunpowder River Beetle. This entry was posted in fishing report on July 17, 2008 by Theaux Le Gardeur. Last week I spent three days fishing the Savage River with my friends, Robby and Bryan Lepczyk. Bugs were abundant in pocket water stretches and in riffles. On any given night, I saw numerous species of Mayflies and Stoneflies. Lime and Yellow Sallies in size #14 combined with hatches of Caddis, Sulphurs, and Light Cahills in size #16 made for some exciting fishing. Midges and BWO’s were hatching in the middle hours of the day. However, in the evening, lots of midges swarmed in clumps above the river. Throughout the mornings and afternoons, Robby, Bryan, and I had success fishing attractor dries. We often skated Elk Hair Caddis’ through the riffles and runs, while an Ausable Wulff was a great go-to dry fly for fishing pocket water. A standard size # 16 bead head prince nymph worked well in deeper water. 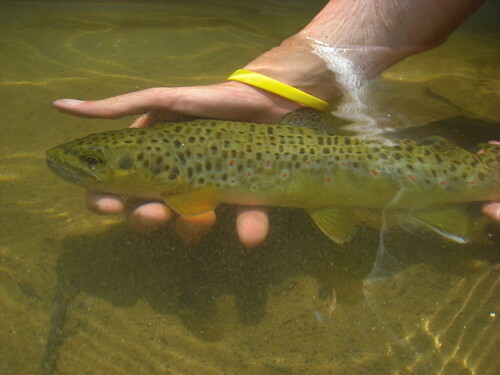 We caught lots of nice brown trout throughout the trip ranging from 9 to 13 inches. However we saw some bigger fish and were able to catch a couple. Robby Lepczyk landed a nice 16 inch brown on an attractor dry fly right before dark on our second night. 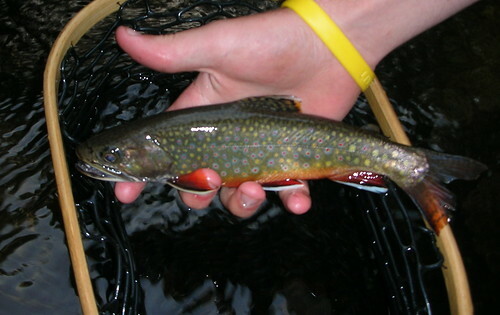 We also found some nice brook trout during our trip. It’s really nice knowing that the Savage is only a three hour drive from Monkton Maryland, and that it is still a wild trout fishery with regulated sections. This entry was posted in fishing report on July 7, 2008 by Alex McCrickard. When other streams in the region become too warm, the Gunpowder’s cold flows, at 56 F during the first week of July, offer great trout fishing. 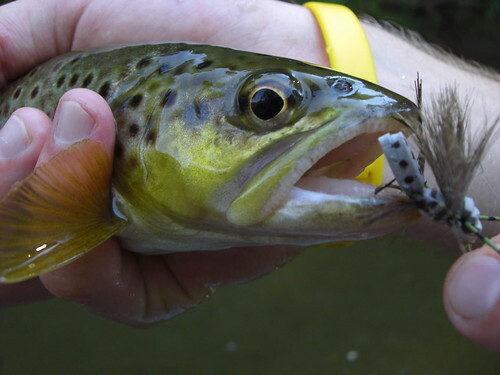 During hot summer months some of the most exciting dry fly fishing on the Gunpowder River begins. Beetles, hoppers, caddis, tricos, blue wing olives, and ants are just a few of the dries that produce trout throughout ALL seventeen miles of river the next months. Consider twitching a large #8-12 Elk Hair Caddis through riffles to imitate all the moths that are flying around along the river. Spend time prospecting the banks, edges, under trees and around rocks with attractors, instead of trying to match a hatch. Mornings have been good for caddis hatches, and could reward anglers with the onset of the trico hatch. Fish are really looking up now, and as always will eat a variety of nymphs, midge and caddis pupa for anglers fishing subsurface. This video post shows off the heaviest rainbow I have ever caught in the lower Gunpowder. The fingerling rainbow in the video was recently stocked above Falls Rd and has adipose fins unclipped, which used to differentiate between wild reproducing rainbows and these previously “clipped” fingerlings. While floating through miles of the Gunpowder River the past weeks, I rolled tape of some quality browns and Matt Devlin losing a big brown in the 18-19 inch range, which leaped in the air before bulldogging to the bottom. Few rivers can match the varied water, scenery, fish and icy cold water conditions the Gunpowder offers. This entry was posted in fishing report, video on July 5, 2008 by Jason du Pont. The Gunpowder River is clear, flowing at 75 Cfs, and is 56 F. Caddis and Sulphurs in the #18-20 range have been accounting for a number of fish in the evenings. I spent Monday evening with a friend just in, and a little jet lagged, from West London who, at approximately 2:00 AM British Summer Time managed a 13″ rainbow on a #20 Unusual and 7x tippet. For those interested in larger Rainbows the Lower River still has a few gigantic rainbows from the Freshwater Institute. They’ve proven to be hard to get but if you’d rather chuck streamers, they might provide some light entertainment-be sure to bring plenty of 3x-not something you’ll hear on this site very often…Thanks to Dave for the following glimpse into his evening antics in the catch and release section. For those of you that have not fly fished the Gunpowder since early Spring, Backwater Angler moved May 1, 2008 to a new location at 16928 York Rd, Monkton, MD 21111. The Wood Elf “sez” fishin has been pretty good, (for some) the past week. Wed night: strong Sulfur hatch occured at the bottom of the Falls road high trail. Was already happening at 7pm and continued in 20 min pulses till dark. Fish were-a-rising in the riffles and quiet water. Caught 10-15 fish (up to 13 in) on a Renegade until just before dark; then caught 5-6 more before dark on the last fly (spinner pattern). Lot’s of Lime Sallys and a few Caddis were hatching too. “Heard” rumors this happened all the way down to Bunker Hill in the fast riffles. Friday 11am-5pm: Fished the upper section from the high trail to the dam There was no hatch to speak of all day, however the fish rose to the “right” flies all day. Caught about 10 fish up to 12 inches and dropped two nice ones, maybe up to 14-15 inches. Missed many-many splashy strikes. Fish were taking X-Caddis (light body size 18 and 20) while the sun shined…and stopped when the clouds came in thick. A Lival emerger did the trick under the cloud cover for a few more fish. Friday night: Fished Upper section at base of lower trail. Big news was that Max caught a beautiful brown at least 15 maybe 16 inches on a streamer. There were a few Sulfurs and Caddis hatching. Caught a couple guppies on the X-Caddis and then switched to a size 12 Renegade and caught 8 more (up to 12 in). 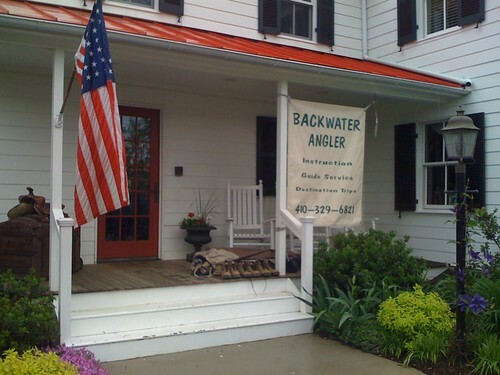 Backwater Angler will be open this Friday, Independence Day from 10:00 AM till 4:00 PM. This entry was posted in fishing report on July 2, 2008 by Theaux Le Gardeur.